Al Filreis was joined for this episode of PoemTalk by Evelyn Reilly, Joshua Schuster, and James Sherry to discuss the title poem of Mei-mei Berssenbrugge’s book Hello, the Roses (New Directions, 2013; 58–62). Berssenbrugge’s PennSound page includes two recordings of her performance of this poem. The recording we played before our discussion is from a reading given at Dominique Levy Gallery in New York in March of 2016. Angela Carr, Anna Strong Safford, and Mytili Jaganathan joined Al Filreis to discuss a poem published in Divya Victor’s book Kith (2017; BookThug/Book*hug). The last section of Kith includes a long alphabetical poem called “Foreign Terms.” The “W” poem in this sequence is “W Is for Walt Whitman’s Soul,” and that is the work we ponder in this episode of PoemTalk. At the autumn 2017 Book*hug launch, Divya chose the read this poem; a video is available. 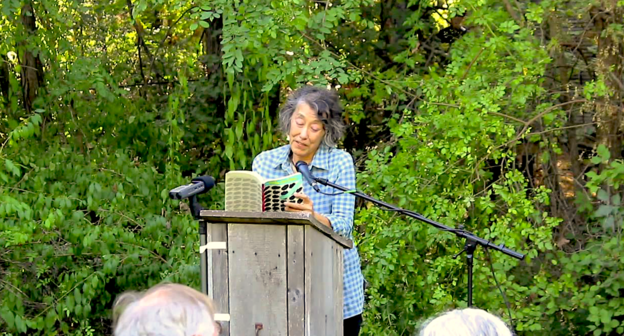 In this special episode of PoemTalk we discuss a poem by G. Maria Hindmarch, who was at the center of the emerging avant-garde and counterculture literary scene in the early 1960s and later. Maria attended the 1963 Vancouver Poetry Conference, established productive connections with Black Mountain poets among many others; published three books; and made audio recordings as a feminist, materialist, and literary communitarian. The poem we discuss is currently still unpublished; it is titled “Kitsilano (1963–1969).” Karis Shearer, Deanna Fong, and Erín Moure joined Al Filreis in Montreal to make this audio and video recording. Ariel Resnikoff (left) and Ted Rees (right). Ted Rees, who recently relocated from Northern California back to his hometown of Philadelphia, and Ariel Resnikoff, who recently relocated from Philadelphia back to his previous home in Northern California, met up at the Wexler Studio at the Kelly Writers House in October to read from and talk about Ted’s new book, In Brazen Fontanelle Aflame. From left: Jeff T. Johnson, Whitney Trettien, Amy Paeth in the Wexler Studio of the Kelly Writers House. Jeff T. Johnson, Whitney Trettien, and Amy Paeth joined Al Filreis to discuss a passage (pp. 73–79) from Rachel Zolf’s Human Resources (Coach House, 2007). Human Resources offers a critique of corporate language as inimical to poetic language, yes — and yet Rachel Zolf strongly undoes any such easy distinction. The work insists on the reality of nonsubjective language, managing to coerce this aspect of meaning up to the writing surface so that we can no longer repress its inhumanity even as we inevitably find ourselves seeking the poetry in it. From left: Amber Rose Johnson, Tonya Foster, and Davy Knittle. Amber Rose Johnson, Davy Knittle, and Tonya Foster joined Al Filreis to discuss the poem “Riot” by Gwendolyn Brooks. “Riot” is the title poem in the (now rare) chapbook published by Dudley Randall’s Detroit-based Broadside Press in 1969, and has been collected variously, including in the book Blacks (1994). The Eclipse site offers a PDF copy of the original Riot chapbook. The recording used as the basis of this PoemTalk conversation comes from a reading Brooks gave at the Guggenheim Museum in New York City on May 3, 1983. From left: Susan Schultz, Sally Van Doren, and Huda Fakhreddine. Susan Schultz, Sally Van Doren, and Huda Fakhreddine joined Al Filreis to talk about Sylvia Plath’s poem “The Stones.” It was written in October or early November of 1959 and appears as the seventh poem in a seven-part sequence called “Poem for a Birthday.” The recording the group hears at the start of the conversation comes from a studio performance Plath did for BBC Records between 1960 and 1962 (and this particular performance probably dates from 1962). The most readily accessible copy of the audio has been posted at YouTube. 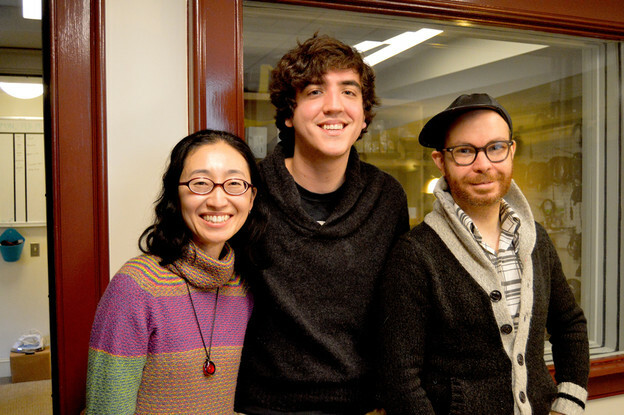 Sawako Nakayasu, Donato Mancini, and Gabriel Ojeda-Sague joined Al Filreis to talk about two poems by Sueyuen Juliette Lee. The poems were published in a chapbook titled Perfect Villagers (2006) and later collected in That Gorgeous Feeling (2008). “Dear Margaret Cho” (actually one of two poems of that title) and “Daniel Dae Kim” were among the pieces from the “perfect villagers” series performed by Lee in a reading she gave at the Kelly Writers House in January of 2007. The recording can be found at Lee’s PennSound page. Al Filreis and Zach Carduner traveled to Los Angeles to the home of Marjorie Perloff where they made a sound recording and film of a convesation about a poem by John Ashbery with Susan McCabe, Robert von Hallberg, and Marjorie herself. The poem is “The Short Answer” from a late book, Quick Question (2013). There are, abounding, the usual marooned pronouns, and the typically high “daftness quotient.” Marjorie and Al chose this poem with the goal of exploring of what it means to read closely and talk in detail about a seemingly “minor” poem from a “major” poet — a poem that might strike readers as an effect of Ashbery’s incessant and seemingly easeful poetic fermentation.